Remove side shoots of tomatoes is the removal of superfluous lateral shoots from the Bush. Timely and proper formation of tomato in open soil and in the greenhouse, will allow the plant to direct its energies to fruition. Otherwise, a tomato plant will grow green excess weight and will not have time to form fruit. Side-shoot removing is considered an important farming techniques for tomatoes. If not to form, of the abundant harvest can not think. Improvement of the lighting conditions in space. The increased power of the fruit. Lengthening the timing of fruiting. The probability of full ripening tomatoes on the vine. The formation should begin only after all the bushes stronger, will be hard to grow. Remove the shoots just when the length does not exceed 5 cm. To begin the formation of a Bush preferably in the morning. To continue the work of cleaning the shoots need throughout the summer season. 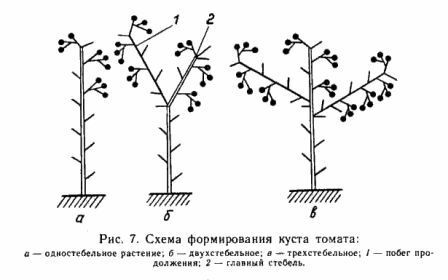 If the formation comes in 3 stems retained the basic escape and 2 lower stepson, 2 barrel - stored main escape bottom escape under the 1st inflorescence, 1 barrel - retain only the main stalk. How to determine how many stems to leave? This number will tell you the preferred variety of the plant. To obtain the most early of the fruit you want to pick a low-growing determinate varieties. They need to keep 1 or 2 of the stem. In this case, the tomatoes will begin to ripen in the first 3-5 hands. Determinant tomatoes are distinguished by the fact that complete their growth in result of setting a certain number of brushes. Determinantal varieties are divided into superdeterminant - very early, usually do not require pinching, and just the determinant, which have to form, eliminating unwanted stepchildren. Have determinantal varieties 1 flower brush is formed after 5-7 leaves, new brushes are put every 2 sheets. 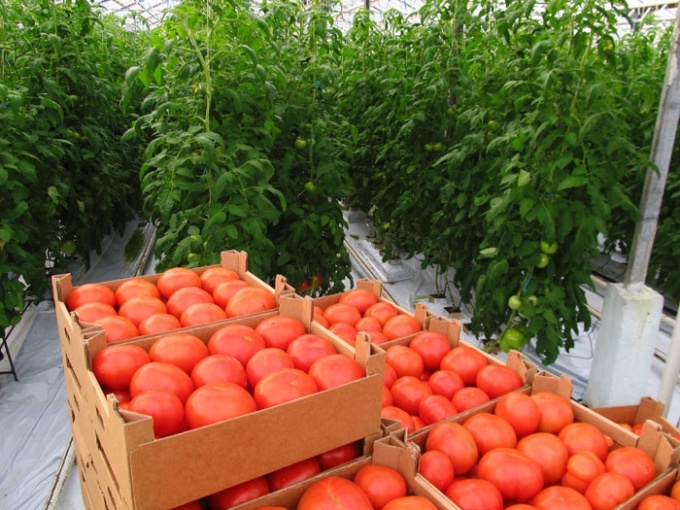 Indeterminate varieties and hybrids of tomatoes differ unlimited growth of the main stem. In terms of heated greenhouses and in warmer climes, these plants have a chance to grow, bringing 40-50 harvest brushes. This sort is strongly recommended to shape. They have removed all stepchildren and lead into a single stem. From indeterminate varieties first brush is formed after 9 sheet, new brushes are put through 3 sheets. Tomatoes in the greenhouse are formed much faster than in the open ground. Stepchild they have before beginning to be laid floral brush. In this case, power plants are spent on the growth of the total mass of the leaves and stems, not the plant. Certainly need to remove side shoots during the summer season, in order to get a harvest, not only attractive, but completely useless bushes. 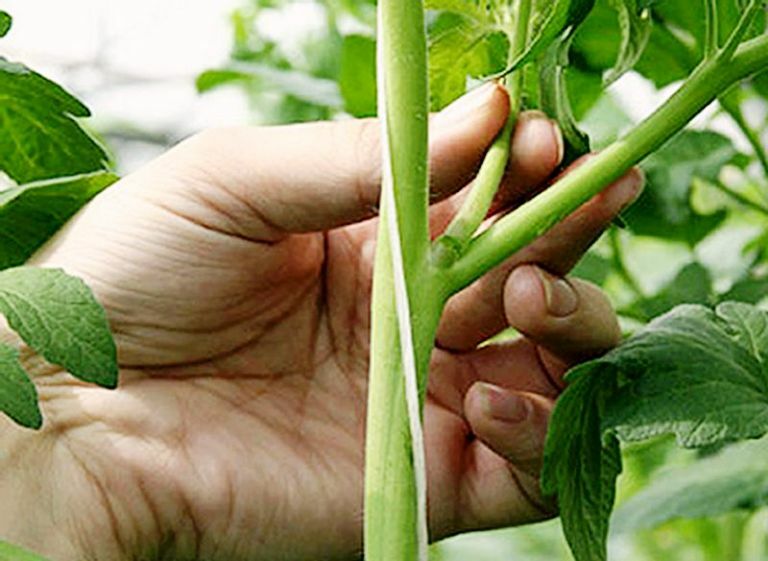 In tall varieties, it is recommended to leave a single stem, removing all suckers. Leave only small stumps 1 cm. Determinate varieties usually form a 2 barrel. In the formation of the Bush in two stems to leave 4 to 8 brushes. In this embodiment, the fruits are bound to be not only numerous, but also ripe. Proceed pasynkovat most varieties of tomatoes should be in a flowering period 1 floral brush. The periodicity of not less than 1 time in 10 days. Work must be carried out accurately and quickly. The most common method of pinching the tomato is the breaking of the shoots by hand. The operation is preferably handled with gloves. Side-shoot removing is usually carried out in the morning, during this period, the stems break off easily. You can also pasynkovat tomatoes with a knife or scissors. Blade cutting tool must be sharpened. Competent remove side shoots of tomatoes gives you the opportunity not to increase the green mass, and a fairly good quality crop of the fruit. Thus all the tomatoes are well filled and healthy.